ROAD TOWN, Tortola, VI – Leader of the Opposition Honourable Andrew A. Fahie (R1), talk show hosts and members of the community on a number of occasions have continued to demand good governance, accountability and transparency from its leaders. 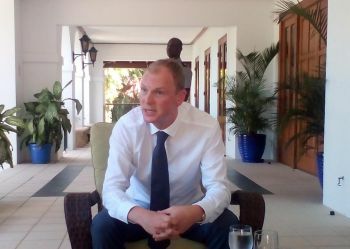 During a media meet and greet yesterday August 29, 2017 at Government House with the newly appointed Governor, His Excellency Mr Augustus J. U. Jaspert, who has completed one week in office, said the issue of ensuring good governance is not a role for him alone but for everyone within the territory. Furthermore, Governor Jaspert noted that what actually tests governance is “actually making sure that governance can be done collectively in terms of accountability, the right level of transparency, the right processes, fair procedures and integrity in all decision and those kinds of things,” adding that members of the community and persons in power can say “yes that was the right thing to do”. He admitted that there might be some political differences within the government or the community but ultimately it should be a decision that can be upheld because it was the right thing to do and it was done in the right manner. In response to steps he would take if he notices that good governance is not taking place within any sector, he explained that he expects the local institutions to uphold good governance at all levels, adding that he will support and assist them where needed. In addition, he commented that he will help to boost the institutions, however, if needs be his first step would be to question how they (institutions) are being supported locally rather than necessarily depending on the governor. “The governor’s role is to try and support the whole system to be as effective as it can be rather than to make it a personal issue just for myself,” said Governor Jaspert. What do you want him to do really? If you guys used to read and understand you would realize just how misguided and retarded you sound when blogging nonsense. Do some research into the duties and responsibilities of a Governor. He is right! You have people here benefitting from the underhanded nonsense on one hand and then calling for governor to intervene when the gravy dries up. It starts with all of us. The governor is setting the tone and basically saying he is not here to play politics. Give solid examples of issues where Governor intervention will be of any help. the problem is- it may not be the players-- but the system itself that allows corruption. If it is challenged, then the questioner is reprimanded or shunned. The system itself doesn't allow for holding people, ministers, government's feet to the fire because too many people have bought into the crooked system. New elected officials HAVE to address this. @ foxy: let's keep that hope alive !!!! If we can only have an audit of the tortola pier park! !